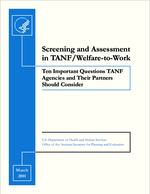 Screening and Assessment in TANF\Welfare-to-Work: Ten Important Questions TANF Agencies and Their Partners Should Consider. Question Nine: What issues related to privacy and confidentiality should be considered? In considering how to screen or assess for unobserved barriers, TANF agencies and their partners must consider the complex issues around privacy and confidentiality of information obtained through the identification process. A detailed assessment of these issues is beyond the scope of this report,79 but, because of the importance of the issue, we provide an overview of the legal underpinnings for privacy and confidentiality of information handling. Although issues related to confidentiality are complex, many states have found effective ways to address these requirements in order to meet clients' needs. Experts emphasize that concerns about or initial struggles with privacy and confidentiality requirements should not inhibit states and localities from providing services to address clients' needs. As noted throughout this report, screening and assessment for unobserved barriers and the provision of services to address barriers requires that programs serving TANF recipients share individual data with welfare case managers (and sometimes vice versa) about clinical assessments, program participation, and client progress. Such data sharing raises complex issues around privacy and confidentiality. These issues include the fear of social stigma, inability to obtain health insurance, and physical harm or even death (in the case of sharing information about domestic violence situations). modations in order to take a GED exam, might wish her disability to be kept confidential from prospective employers so as to avoid the inappropriate but all too common stigma of being perceived as "dumb." Yet, her welfare case manager might encourage her to reveal the learning disability to the employer in order to obtain accommodations in the work place. Section 188 of the Workforce Investment Act (WIA) of 1998. We would add that, in some cases, confidentiality laws are legislative responses to real financial, personal, or physical threats to safety. Welfare case managers must be cognizant and well-trained about the conflict that arises between the need to share program and service information among partner agencies, and the need to maintain client privacy and confidentiality. Failure to maintain the proper balance can lead to real harm to clients. Failure to obtain written informed consent to disclose information can lead to lawsuits against the agency. Yet, failure to lawfully obtain vital information on a client's progress in program services can result in ineffective case management, inappropriate service planning, or inappropriate case closure. In order for case managers to be cognizant and well-trained, policy makers and other state officials must inform themselves of the laws, regulations, and issues, in order to pass on appropriate information and safeguards to case managers. 79 Much of the information from this section was taken from, and further detail can be found in, the U.S. Department of Health and Human Services, Center for Substance Abuse Treatment. Technical Assistance Publication Series (TAP) Series #24. Welfare Reform and Substance Abuse Treatment Confidentiality: General Guidance for Reconciling Need to Know and Privacy. Washington, DC: DHHS, 1999. 80 This law contains language specifically requiring the Secretary of HHS to develop and issue regulations governing the privacy and confidentiality of mental health patients' records. HHS issued proposed regulations for public comment in November, 1999; final regulations await incorporation of commenters' suggestions for revision. 81 Brady, Henry E. et al. Access and Confidentiality Issues with Administrative Data. UC DATA, Draft for discussion purposes only. Berkeley, CA: University of California, Berkeley, Data Archive and Technical Assistance, December 9, 1999.